>>> Currently Serving: All of San Diego Central. Including PB, OB, Downtown, Hillcrest, North Park, University Heights, City Heights, Clairemont, Linda Vista, Mission and Fashion Valley, Basically from Highway 52 down to Highway 94 and from the Ocean to Highway 125. 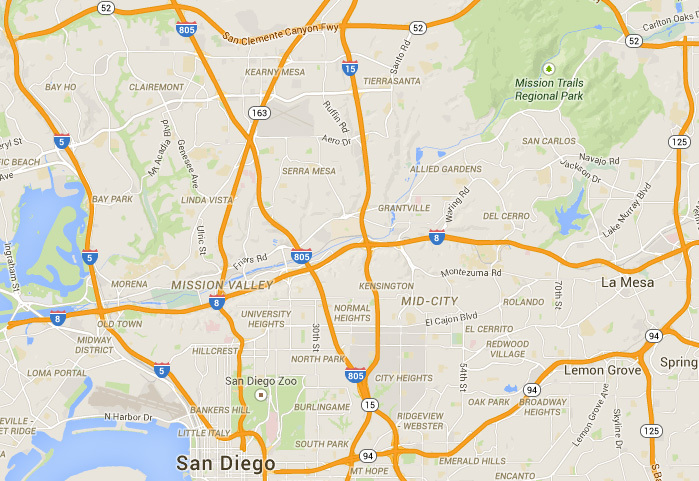 Now serving: South Bay; Chula Vista, Bonita, National City, East County; El Cajon, La Mesa, Spring Valley, Lemon Grove. Just ask if we are serving your area also. 2Do I have to be at home or at work when you pickup and drop off? It is not absolutely necessary for you to be present when we pick up your order. As long as arrangements have been made in advance. 3When will I get my laundry back? All wash, dry and fold orders can be returned within 24 Hours. Same day service is available at an additional price and with restrictions on time of pick up and delivery. Please ask in advance if this is available for you and your area. 4Can you come to my Hotel/Motel and Pick up my Order? Yes we can and do. Orders are picked up and dropped off 24 Hours later. We do offer "SAME DAY SERVICE" - with restrictions and special pricing. We do not do Dry Cleaning. 5What constitutes ‘normal’ processing for wash, dry and fold orders? –Washing: Every wash is processed by your instructions (Hot – Cold – Warm – Delicate etc. )–which ensures your clothes come out the way you want them- clean and smellin’ good!. –Dryers: We use large efficient dryers to get your clothes dry quickly and our professional staff members always remove items promptly to avoid wrinkles. We use softener sheets when requested. We use the “Low or Medium” heat temperature setting for most loads. Medium or low heat is always used on more sensitive clothing. 6What if my items are wet or more than damp? 7Do you sort my order by color and special handling? Yes, we sort all orders by color. Any special instructions you give us are followed to the letter. If you have one dark item, it is washed separately. 8Do you “hang dry” special items? Yes, we will hang dry any and all items you specify. 9Do you mix my clothes with other people’s clothes? No – NEVER. We put your clothes in your own washers and dryers. We label each washer, dryer and laundry cart with your identifying information. 10Is there a minimum weight or charge? The minimum “FREE” pickup and delivery charge is based on 20 pounds. Hotels are 10 Pound minimum with a higher rate per pound. We bill to your credit or debit card directly thru Square or PayPal. (We do not retain your CC information.) All customers receive an email invoice every time their card is billed. For security reasons our drivers do not carry any cash and therefore cannot make change. Your laundry is always processed by professional staff members and closely monitored to insure quality service. Since your laundry is usually processed on the same day and at the same time each week, it will usually be processed by the same team of staff members. 13Do I have to be at home or at work to receive my finished order? No, you do not have to be there in person - as long as you have made arrangements in advance. We will notify you when we are in route to deliver your order.